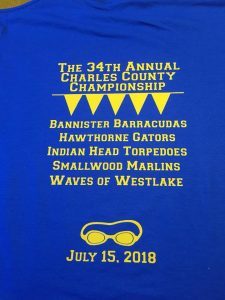 For the past 34 years, the Charles County swim teams — Bannister, Hawthorne, Indian Head, Smallwood, and Westlake — have a fun and competitive championship. This year, it was run by the Waves of Westlake and held at Dorchester pool. To commemorate this occasion, they asked for tees, tanks, and hoodies. 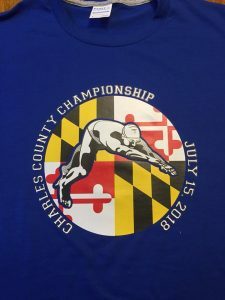 The front design features a Maryland flag (easily the coolest flag of all the States), while the back listed the teams.